She’s the beautiful Welsh songbird who escaped a 1960s time capsule. Introducing our sizzling February cover star, Duffy. SEE DUFFY’S GORGEOUS SHOOT PICS HERE! Rockferry became the best-selling UK album of 2008, go on to sell 6 million copies worldwide and earn her three Brits. Yet her enduring memory of that time is of hearing the album title track being played by Jo Whiley before disappearing without trace after failing to break into the top 100. ‘You know,’ she confides, folding her arms round her 5ft-nothing frame, ‘at any given time I can walk away. It’s not a problem. It can be easily arranged. ‘If people don’t want this, then I’m cool with that. I do it for others. I don’t do it for myself. If people don’t want the records, it’s OK – it’s no problemo. I don’t take it personally. I’m here to serve. There’s no doubting the connection she feels with Dusty Springfield; it’s a bond that extends beyond the late singer’s music. Duffy cheerily reveals how she often shares ‘tea and biscuits’ with Springfield’s old friends in Henley. And where does she see herself in 20 years time? ‘Where I want to be and where I think I’ll be are very different things. The way history would have it is that I would end up in some form of tragic event. ‘The people that I’ve loved – Dusty, Marvin, Edith Piaf – they didn’t always have happy stories. That’s the way history would have it. 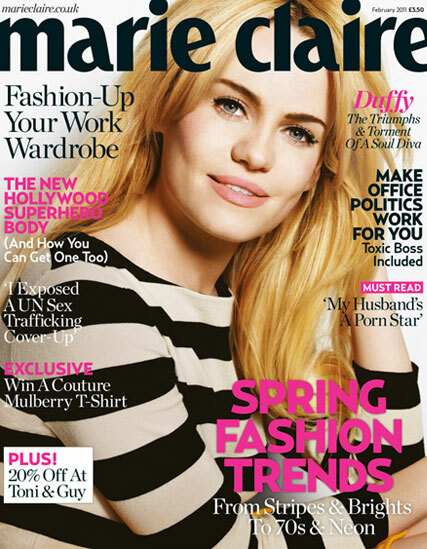 Read the full interview with Duffy in Marie Claire’s February issue, on sale tomorrow.